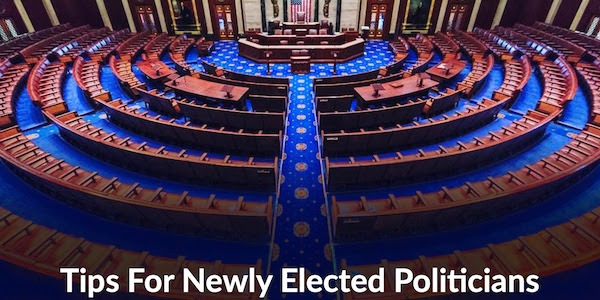 Washington, D.C., Feb. 7 – As newly elected officials begin their service, it is important that America’s largest minority group are included in policy discussions in a meaningful way. Thus, RespectAbility put together an easy guide with eight tips for leaders and their staff to ensure they reach this important constituent group. 1) Start right away on building connections to people of disabilities and disability groups in the same way that you do with other groups of constituents. America has 56 million people with disabilities, more than 20-million of whom are working age. Polls show that the majority of constituents either have a disability or a loved one with a disability. The extended disability community — when you include family members, those with close friends with disabilities and those who work on behalf or volunteer for a disability cause — is 63 percent of Americans. We want to be included in all policies that impact our lives and we are ready to be your partners in success. 2) Include people with disabilities, who are experts in disability issues, as staff members, including senior staff and on constituent committees. “Nothing about us without us” is more than a slogan in the disability community. People with disabilities have a lot to bring to the table. True, they might need accommodations to get to the table in the first place. But most accommodations are free or under $500. Make sure that constituents are aware that you are willing to accommodate them. Schedule interviews at an accessible location and keep transportation in mind. The most important thing to do is to treat any person with a disability with the same respect and high expectations you would treat any other person. Use vendors who are or who hire people with disabilities. We also encourage you to include information on disability rights/issues on your website, as well as to include people with disabilities in your videos and photo-ops in an inclusive way. The photographs and stories you share, events you advertise, and language you use in your mission statement, “about us” and other sections should reflect that individuals with disabilities are welcomed, valued and included. Learn more about etiquette on interacting with people with disabilities: www.respectability.org/inclusion-toolkits/etiquette-interacting-with-people-with-disabilities. 3) Put out a statement that says you want people with disabilities to be fully included in society, just like all other Americans. When you put out a statement, share it with LaurenA@RespectAbility.org so we can ensure that the disability community sees/hears it. Talk about how you will create new job opportunities for people with disabilities. When you are asked about disability issues and default to talking about benefits or only healthcare, it insults our desire to work and fully participate in our communities. Yes, a safety net is very important. However, studies show that most people with disabilities can and want to work. If you have ever hired people with disabilities or done something to enable people with disabilities to have a better future, talk about it! Many organizations such as Best Buddies, National Association of Councils on Developmental Disabilities (NACDD), National Council on Independent Living (NCIL), Paralyzed Veterans of America (PVA), National Organization on Disability (NOD) and RespectAbility have concrete policy recommendations on how to lead on this issue. Our nation was founded on the principle that anyone who works hard should be able to get ahead in life. People with disabilities deserve equal opportunity to earn an income and achieve independence just like anyone else. People with disabilities bring unique characteristics and talents to the workplaces. They can work in hospitals and hotels or apply their talents to develop computer software and website design. There are no limits to what they can do. Great companies like JP Morgan Chase, Coca-Cola, UPS, IBM, Walgreen’s, SAP and EY have proven that employees with disabilities are good for business. If we find the right jobs for the right people with disabilities, it can and will benefit the bottom line of companies. 4) Build a more inclusive environment by learning and using respectful language. Many people with disabilities prefer “people first” language, which emphasizes individuals’ strengths instead of their disabilities. Person-first or people-first language is a way of describing disability that involves putting the word “person” or “people” before the word “disability” or the name of a disability, rather than placing the disability first and using it as an adjective. The purpose of people-first language is to promote the fact that someone’s disability label is just a disability label—not the defining characteristic of the entire individual. There are members of certain disability groups in the U.S. who prefer not to use it, such as the American Deaf community, people who are blind and a number of Autistic people/Autistics. Their reasoning is that they consider their disabilities to be inseparable parts of who they are. Using person-first language, some also argue, makes the disability into something negative, which can and should be separated from the person. Think about other language that you use. For example, instead of describing someone as “wheelchair bound,” describe him as a “person who uses a wheelchair.” Don’t use words like “stupid” or “retarded” to mean incompetent. There are many resources on appropriate communication that can be helpful to you and your staff: www.respectability.org/inclusion-toolkits/terminology-tips-using-the-appropriate-lexicon. 5) Ensure your social media and website is accessible to people with hearing and vision differences. People with disabilities use the Internet, so websites need to be set up for use by screen readers and people who need captions. Best practice is to ensure that millions of people who use screen readers can access your website. By making your website fully accessible for those who have either visual or auditory disabilities, you will be able to reach millions of additional views. Has a person who is blind and who uses adaptive computer technology checked your website for accessibility? In order to do so, all online videos and audio files should include captions. Video hosting sites such as YouTube and Vimeo have free tools that allow users to add automated subtitles to their clips, but this is not as reliable. Auto captioning, which is great technology, is not always perfect. We would recommend ensuring the accuracy of the captions. Making a transcript of the video available online is also an incredibly helpful resource for users who have auditory disabilities, like Deafness or Hard of Hearing. Add textual descriptions, often called “alternative text,” to charts, graphs, images and maps so that they are discernible by assistive technology. Add audio description for materials presented visually. Ensure your website includes a site index. Conduct usability studies for your highest traffic URLs for both your external and internal websites to verify that your websites work effectively with screen reading and other assistive technology. Many of these things also increase your Search Engine Optimization, increasing your reach. Watch RespectAbility’s webinar on web accessibility: https://youtu.be/hSrfeCk_Bzw. Also have a plan in place to ensure that social media postings (Facebook, Twitter and Instagram feeds) are accessible, including blog posts and newsletters. 6) All your events and materials should be ADA accessible. Ensure that all your events are held in accessible locations and that accommodations (i.e. ASL interpreters) are provided when requested. The following sample event checklist will assist you in ensuring accessibility at your events. Does the invitation clearly indicate that people with all abilities are welcome? Do appropriate icons appear (e.g., physical access, sign language interpreter available)? Is the writing clear, in an easily legible font and size? Is the information embedded in an email as well as an attachment? Do the visual images depict inclusion, e.g., people with disabilities? Have you included a contact name and number for inquiries regarding accommodations? Is the notification of the event on your website as well as in hard copy? Is the facility accessible – for wheelchairs, walkers and scooters? Are the bathrooms accessible? Are there designated information/ rest areas available? If transportation is being provided, is it accessible? Is the lighting appropriate for people with visual impairments? Will there be a sign language interpreter? If there are videos, will there be subtitles? Will there be assistive listening devices? Have you made sure that signers, etc. will be visible to those in wheelchairs? Is the website where the event is posted accessible? Is the event available as a webcast? Have you arranged for volunteers? Have they received orientation/sensitization and training to respond to inquiries? At an event, handouts should be provided in an electronic version during meetings and presentations for individuals who need or want to use technology to access and manipulate the materials. Provide individuals with transcripts for purely audio files that do not have a visual component. 7) Make sure that people KNOW that your events are accessible, so they will come! Planning on having access and space for wheelchairs, captioned and audio described videos, sign-language interpreters and communication access real-time translation (CART)? Share this information in your event announcement! Explicitly communicate your desire to include individuals with disabilities. In your event RSVP form, ask participants if they need an accommodation; be sure to put a note at the bottom that you’ll fulfill requests as long as you receive them at least 48 hours prior to the event if it is a small event. All large events should automatically be accessible for wheelchair users, have captions and sign language interpreters. Sample inclusion language to use for accommodations: Accommodation requests should be directed to __________ at 222-222-222 no later than _____________. (name) (deadline if appropriate). Additional language may be added to state that requests for accommodations made after the advertised date will be honored to the maximum extent feasible. 8) People with disabilities cut across every demographic – gender, age, race, sexual orientation, etc., so it is important to think about intersectionality as well. People of color and English as Second Language Learners with disabilities have unique barriers and are less likely to receive the disability diagnosis and early intervention they needed as a child, leading to the school-to-prison pipeline. People who live with multiple minority status are more at risk for school suspensions, dropping out of school, homelessness, addiction, incarceration, abuse and other issues. Issues such as immigration, the school-to-prison pipeline, trafficking and foster care all have both race and disability angles. Ensure that people with disabilities are on panels and programs, especially those on education, poverty, healthcare, employment and social justice.